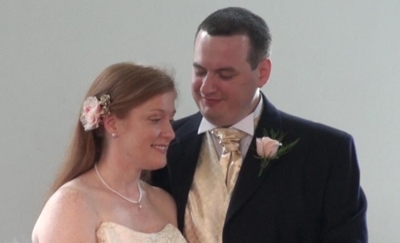 With thanks to 32.ie who recorded the whole proceedings… which was handy since our camcorder packed up on the morning! ON Thursday, Claire Nolan, daughter of Ann and Pat Nolan of College Road married Mark Dennehy from Kerry in the Parade Tower of Kilkenny Castle, in a civil ceremony, surrounded by family and friends. They say that every little girl dreams of getting married like a princess, but until recently if you did not want to marry in a church, you had no choice but to make your vows in a registry office. In Kilkenny that was inside the Health Service Executive building at Lacken, which, at least had some lawn and trees outside, unlike some other counties which had very unromantic settings indeed. Since 2004, the registrar may perform a marriage outside of a registry office. There are conditions, however, and Ann Boyle, the registrar in Kilkenny says that they all make perfect sense considering existing regulations and our climate. The place must be public, in good repair and a solid structure, so no marquees in the garden and no beaches or mountaintops are allowed. It must be a dignified venue with no connection to any religion. There must be room for the guests to sit comfortably and access for those with physical disability. Claire Nolan arrived with her father by car to the Parade Tower. Staff at the castle, Frank Kavanagh and Anne Teehan were on hand to usher her into the lift to the second floor where there ceremony took place in front of waiting guests. Afterwards the celebration was in the Ormonde Hotel and the destination for the honeymoon, well, that was a secret. All at 32.ie wish the happy couple well in their future together. Congratulations to you both! Go raibh saol fada agaibh le chéile. I joked with Claire that I would want to see the video of the wedding – and now I have! Lovely! Hope you are enjoying the honeymoon travels.